Happy-Flex Combination has been formulated to provide a balance of glucosamine HCL, methylsulphonylmethane (MSM), vitamin C and other herbal and food-based ingredients. Also includes turmeric extract (95% curcumin), nettle leaf, Montmorency cherry, Panax ginseng, apple cider vinegar powder, bromelain, horsetail herb, kelp, papain, rosehip and ginger root - all in this formula. 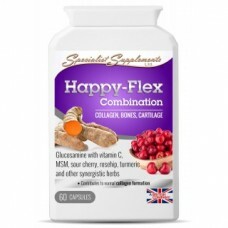 Supports collagen formation, Supports normal function of cartilage and bones. Vitamin C is a co-factor for collagen synthesis. It contributes to normal collagen formation for the normal function of blood vessels, bones, cartilage, gums, skin and teeth. It also contributes to maintaining the normal function of the immune system, as well as normal energy-yielding metabolism, normal functioning of the nervous system, normal psychological function, protection of cells from oxidative stress, the reduction of tiredness and fatigue, the regeneration of the reduced form of vitamin E and increases iron absorption. Athletes, Over 50s, people with hectic lifestyles. Glucosamine HCL: Glucosamine is an amino sugar that is produced naturally in the body. It is also found in seashells, or it can be made in the laboratory. Glucosamine hydrochloride is one of several forms of glucosamine and the glucosamine HCL contained in this food supplement is derived from shellfish. MSM: MSM stands for methylsulphonylmethane, a naturally-occurring source of sulphur. Rosehip: Rosehip is the fruit of the rose plant. Nettle leaf: Stinging nettle is a plant in the genus Urtica that originated as a native shrub in colder regions of Europe and Asia and is now found worldwide. It gets its name from the fine hairs on its leaves and stems that release irritating chemicals when they contact your skin. Turmeric and curcumin: Curcumin is the yellow pigment associated with turmeric, and to a lesser extent ginger. Ginger root: Ginger, aka Zingiber officinale, is a rhizome - a thick underground stem that sprouts roots and shoots. This "hot" spice is native to warmer parts of Asia, such as China, Japan, and India, but is now also grown in parts of South American and Africa. Montmorency cherry: Montmorency cherries are a type of red, sour cherry - Prunus cerasus. Apple cider vinegar powder: Apple cider vinegar is fermented juice from crushed apples. Bromelain: Bromelain is an enzyme derived from pineapple juice. Horsetail herb: Horsetail is a member of the Equisetaceae family; the sole survivor of a line of plants going back three hundred million years. The name "horsetail", often used for the entire group, arose because the branched species somewhat resemble a horse's tail. Kelp: Kelp is a large edible seaweed (algae), which grows in underwater "forests" in shallow oceans.